The Opposition Liberals are accusing the Conservative government of blowing millions of G8 summit-related spending in Industry Minister Tony Clement's riding in an attempt to boost his chances of re-election. The Opposition Liberals are accusing the Conservative government of blowing $50 million of G8 summit-related spending in Industry Minister Tony Clement's riding in an attempt to boost his chances of re-election. 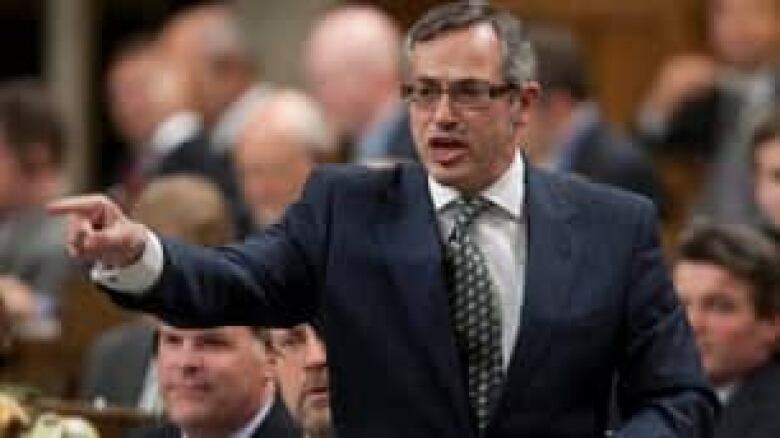 Industry Minister Tony Clement has been under fire for weeks in the House of Commons over federal spending in his central Ontario riding of Muskoka-Parry Sound ahead of the G8 summit in Huntsville. ((Adrian Wyld/Canadian Press))Liberal MPs Mark Holland and Marcel Proulx presented a slideshow at a news conference on Wednesday showing G8 legacy project sites in Clement's Ontario riding of Parry Sound-Muskoka. Dubbing the presentation the "Tour de Pork," the MPs said most of the money has been spent on projects that are nowhere near delegates during the one-day G8 summit and that will not be completed in time for the event. "What has happened here is under the guise of G8," Holland told reporters. "It has nothing to do with G8. They're blowing $50 million to boost the electoral prospects of a minister, and we think that that is entirely inappropriate." When asked why the Conservatives would try to sway voters in a riding Clement won by more than 10,000 votes in the last federal election, Holland noted that the minister only won by 26 votes in 2006. In a lengthy scrum with reporters outside the House of Commons on Wednesday, a livid Clement accused the Liberals of "lying and twisting the truth" about the G8 legacy fund, and said they should instead explain to taxpayers why they support the "wasteful" federal long-gun registry. "I'm cheesed off because I know the people in my riding don't deserve the kind of partisan attacks the Liberals have been doing," he added. Opposition parties have lambasted Prime Minister Stephen Harper's Conservatives for the massive price of hosting the G8 and G20 summits back to back at two sites — central Ontario's Muskoka region and Toronto — hundreds of kilometres apart. Estimated costs for security alone now stand at $930 million, and could exceed $1 billion once the final costs are tallied. Government and summit officials insist the funds are needed to protect dozens of world leaders, as well as thousands of delegates and journalists covering the events amid a medium security threat level. The government was forced to relocate the G20 meeting from Clement's riding to Toronto's downtown core after it was determined the initial site of Huntsville could not accommodate all delegates, security and media. Holland said the amount already spent in Clement's riding meant the government needed a "cover" and couldn't move both summits to Toronto. Such a move might have cut the costs of the summits in half, he said.